So as of the time of this writing, the top three rated root beers in my 13+ years of reviewing and running the site are: Iron Horse Root Beer, Hank’s Root Beer, So Duh! Rockin’ Root Beer. Hank’s was the first of those three that I tried. It was actually the 9th gourmet root beer I ever tried back in early 1998. The company was newly formed and when they heard I wanted to mail order some for my new website, they sent me a free case. Honestly, at the time I didn’t even have the website, but I was in the process of building it, and Hank’s was the impetus for getting it done and up. I loved it immensely. It was much better than Henry Wienhard’s in everything but the Head. I wanted to give it a 5, but I thought it was premature to give out a 5, plus it almost seemed like I was doing that because of the free sample, so I gave it a 4.5. About a year and a half later I tried Iron Horse. I literally got weak in the knees on the first sip (I actually taste tested it standing). The Head was the first to overflow the glass. I loved it and determined it would be the first 5. I got a case for every birthday and Christmas after that, often coupled with a case of Hank’s. Drinking them side by side. I never had my doubts. Then I went on a mission and suffered a great root beer drought. They don’t sell root beer in Madagascar. After two years and a month, I finally returned. My parents had a case of Henry’s, Iron Horse, and Hank’s waiting for me, plus a case of a new variety to review. I didn’t touch the new variety for a month so I could become accustomed again to delicious root beer. I noticed something after about half a case of each, the Iron Horse didn’t seem to be as good. The other root beers seemed about the same, but the Iron Horse didn’t do it for me anymore. I got one more case for Christmas with a case of Hank’s and noticed the same thing. I didn’t go back and compare ingredients with my original bottle though and I didn’t think to review it again, and so I just stopped getting it. And I hadn’t had one since 2004. I kept having Hank’s every birthday and Christmas, but eventually my parents stopped that tradition as well and I hadn’t had one since about 2007. Then a few months ago I tried So Duh! Rockin’ Root Beer. Wow, was I amazed. I wanted to give it a 5 but I didn’t know if it was better than my beloved Hank’s, but I couldn’t find any local, so I gave into my doubts and left it 4.5. A few months later and I found a store that sells both Hank’s and Iron Horse, so I figured it was time to have a show down. To settle the score, to set things straight, to determine what root beer really is the best I’ve had so far. The showdown consisted of binary comparisons. Two frosty mugs, two bottles of different root beers, water and saltines to clean the pallet when switching between the two. I started at the bottom. So Duh! vs. Hank’s. After pouring I noticed that Hank’s has a good Head, So Duh! has an excellent Head. I sipped the Hank’s first. Sweet mother of root beer! I had forgotten how good that was. I mean it’s got it all. How root beer should taste. Sweet, rooty, creamy, spicy. Ah! Then So Duh! Mmm. Love that honey and those spices. Creamy elixir of deliciousness. But, as I kept drinking back and forth. So Duh! just couldn’t hold up. I mean. It is amazing, but, Hank’s is better on everything but the Head, but the Hank’s Head is plenty sufficient for the most adamant connoisseur. I guess my original review placement of So Duh! was correct. 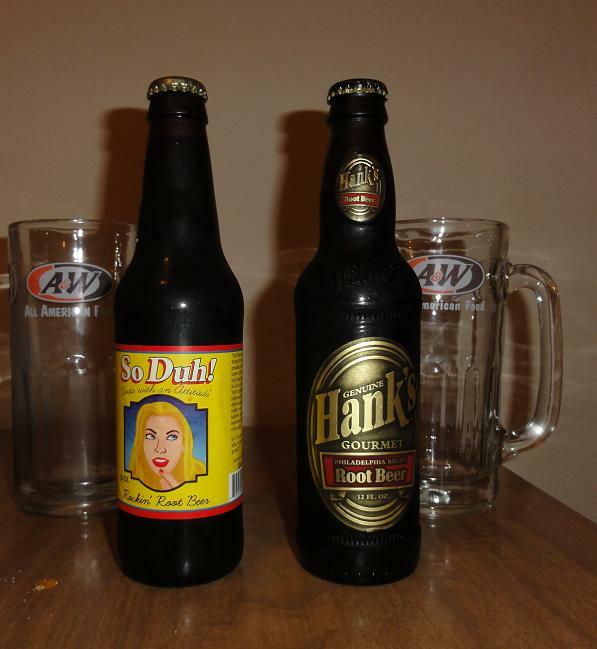 Next round, Iron Horse vs. Hank’s. I poured the Iron Horse. What happened to that amazing Head from days of yore? It wasn’t bad, medium height, decent froth, but not even as good as Hank’s. The taste, sweet caramelized corn syrup with vanilla, herbs, and spices. Good amount of spices, but, nowhere near the same quality of the Hank’s, or even the So Duh! Still good. Still pleasurable. Still a Seal of Approval, but I’d say more of a low 4 and not the 5 I had originally given it. So then, the king has been DETHRONED! In a coup of coups, Hank’s is now the best and So Duh! is up to number two. So then that begs the question. Shouldn’t Hank’s be a 5, the heavenly Elixir of the Gods? I think so. I’ve tried a lot of root beers, and nothing’s topped it except that original Iron Horse. I think the novelty of a free sample has worn off as well. So Hank’s, you have been exalted! Now, So Duh!, (I really hate the exclamation point for making odd punctuation as I write by the way), my original gut feeling was to give you a 5, but I didn’t do it partially on grounds of fearing you not being better than Hank’s. Well, now Hank’s is a 5. I almost think So Duh! should barely squeak in as well, but the core flavor is still just a little too off. It’s a toss up. I really feel it could go either way, and every day and bottle of So Duh! I drink I seem to change my mind, it’s so down to the wire, and maybe that should tell me, that you really shouldn’t be a 5. So Duh! you remain the same! Iron Horse, what happened? I need to go back to my parents house, dig out the sealed wooden crate, find the original bottle I saved, and see if you changed recipes like Tommyknocker. You’re more like a low 4 now, so you have been abased! But let’s be honest, having a Seal of Approval is still top notch, just not the top of the top. And before anyone calls blaspheme, or says I’m being inconsistent, my policy has always been that root beers can fall if they change their recipe, or I would reevaluate with the chance to rise at a bottlers request. Check the Wayback Machine if you don’t believe me. I don’t take lightly my top ten root beers, so rest assured that much soul searching and root beer drinking is behind this major decision. So there you have it. I think now that all is right in the root beer world. That’s right folks, there is an exclamation mark after the word root beer in the title. Unlike the few others that have done this, So Duh! and Dang! That’s Good, the fine people at Big Ben’s are emphasizing that it is Root Beer! They also say “Satisfying!” so they are pretty close to getting carried away with those exclamations. But, when you consider that Big Ben’s has been around continuously since the 1920’s with a line of 23 different flavors and 11 different packaging styles, there is a lot to be excited about. Such a robust independent soft drink company these days is a rare find indeed. Normally, they don’t ship their sodas in glass bottles but thankfully made an exception for yours truly. That way I didn’t have to go all the way to Pennsylvania to get it. Choice! It has a full dark Body. It is strong with sassafras and hints of anise and wintergreen. It is only slightly creamy. I prefer more creamy. The Bite is very mild, mostly from carbonation. The Head builds to a good height but isn’t very frothy at all and quickly fizzes away. The Aftertaste is mild wintergreen and sassafras. So overall it’s a decent brew but there really isn’t anything exceptional about it. It is the sort of standard supermarket line of root beer that you’ll find out there (for those supermarkets that bottle them in glass) which makes sense from a soda company with so many flavors that doesn’t specialize in root beer. Good enough to keep in business but it isn’t winning any awards. 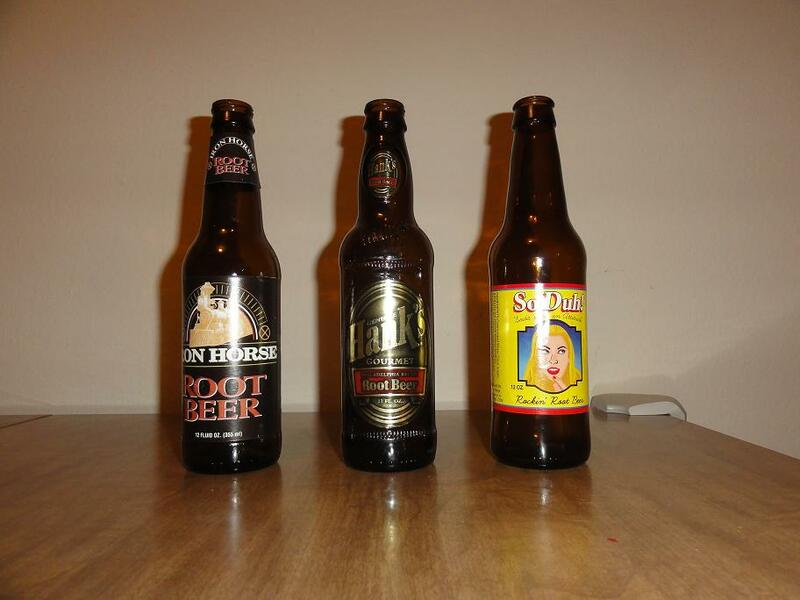 See how it rates against other root beers. Posted by GourmetRootBeer at 12:01 am	Tagged with: Big Ben's, Dang! That's Good, So Duh! What a name! What a picture! I love a good pun and this takes it to a whole new level. A guitar rocket ship blasting through the “Rock It” title banner. This is on the level of a picture of a sword guitar with the caption “one does not simply ROCK into Mordor” Such awesomeness could only come from the people at Emack & Bolio’s, makers of fine gourmet ice cream that is both rocket and rock and roll themed. They say that they microbrew their sodas to both compliment their ice cream or taste great on their own. The only other Rock themed root beer I’ve tried so far is So Duh! Rockin’ Root Beer which is amazing so I had high hope for this one. This is a very unique brew. The Body is rich and full but not dark. It’s sweet and crisp from the cane sugar and there are hints of vanilla coming through. It tastes great! The Bite is strong from a combination of spices and the carbonation. The carbonation releases suddenly from the liquid and gives a slight acidic flavor and burn as it bites you. The Head is very strange. It is very dark colored and bubbles up quickly to a medium height. Then, rather than fizzing away, the bubbles coalesce into larger and larger bubbles before the one large bubble pops. This all happens in about 10 seconds and I’ve never seen anything like it before. It seems that their carbonation process is different than the normal method (water and CO2 are separate ingredients rather than carbonated water) and that may have something to do with it. The Aftertaste is sort of spicy caramel with some vanilla. It is really good. So, this brew does taste great and it would make a wonderful root beer float. In fact, the way it is carbonated would probably work great to build an epic frothy float. The flavors are all in place for this brew but the Bite and the Head are just a little too off for the Seal of Approval. It will go great with food though, and would be a fun change up from the normal root beer routine so it’s definitely worth getting now and again. See how it rates against other root beers. Posted by GourmetRootBeer at 12:01 am	Tagged with: Emack & Bolio's, Rockit, So Duh!